So there’s that. But, I contend that things are looking up for the Orange and Black and they can easily continue their quest for a playoff spot. In their last 5 games, the Flyers have 4 wins and one overtime loss, and they are scoring over 3.5 goals per game in that span. Their offense is waking up, with scorers like Giroux, Jakub Voracek, and Wayne Simmonds slowly beginning to tally points. And Philadelphia’s much maligned power play has scored 5 goals in the last 4 games. And then there’s the curious case of Steve Mason. After winning the Calder Memorial Trophy as the NHL’s rookie of the year in 2009, Mason struggled in Columbus, failing to live up to his rookie hype. He was traded to the Flyers last April, and found the change of scenery to be inviting and motivating. He went 4-2 at the end of last season with an impressive 1.90 GAA. This season, Mason has been the Flyers’ best player. Although his record is a losing one (mostly because of atrocious goal scoring), he has a 2.12 GAA and 93.2% save percentage (both 10th in the NHL). It appears that Philadelphia’s years of goalie woes might be over. At just 25 years of age, Mason has plenty of room for growth. The Flyers upcoming schedule also shows signs of hope. Tonight, Philadelphia hosts a Buffalo Sabres team that is sinking faster than the Titanic. After that, the Flyers host the Islanders on Friday and travel to Miami to play the Florida Panthers on Monday. And despite all the struggles, all the trials, and all the criticism and public scrutiny, the Flyers are only 3 points out of a playoff spot. That’s extremely easy to make up with 62 games left to play. “The team looks good right now,” defenseman Kimmo Timonen said yesterday. “A lot of things are going well for us now and we have to keep it going.” Indeed, things are going well, and if they continue, the Flyers could rise quickly in the Eastern Conference standings. 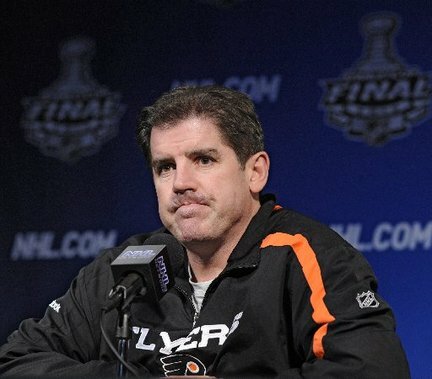 The Philadelphia Flyers announced this morning that they have fired head coach Peter Laviolette. After starting 0-3, Flyers’ management needed to shake up an organization that has looked non-competitive for the second straight season in a row. After starting last season 0-3 and missing the playoffs for the first time since 2007, the Flyers were outscored in their first three games of 2013 9 goals to 3. Laviolette joined the Flyers midway through the 2010 season, where he led the Flyers to a dramatic shootout victory on the last day of the season to clinch a playoff spot. The rest is history: the 7th seeded Flyers became the third team in NHL history to come back from a 3 game deficit to win a playoff series against the Boston Bruins. The Flyers then won their first Eastern Conference title since 1997 and came within 2 games of winning the Stanley Cup. Laviolette also led the Flyers to an Atlantic Division title in 2011 and a dramatic, emotional victory over the rival Pittsburgh Penguins in the first round of the 2012 playoffs. So what’s my point here? THE WRONG MAN LOST HIS JOB. Flyers GM Paul Holmgren is responsible for most of the mistakes in the Flyers organization. Sure he was at the helm when the Flyers went to the Cup Finals in 2010, but most of the players weren’t his. Mike Richards, Jeff Carter, Simon Gagne, and Claude Giroux were all products of Bob Clarke’s GM days, not Holmgren’s. Moreover, Holmgren is known for blowing up the Flyers roster, trading captain Mike Richards and leading scorer Jeff Carter in 2011 so the Flyers could sign goaltender Ilya Bryzgalov. Yeah, that happened. The result was that Richards, Carter, and Gagne won a Stanley Cup in Los Angeles, the Flyers were embarrassed in the second round of the playoffs, and the Flyers “humongous big” goaltending problems persisted. 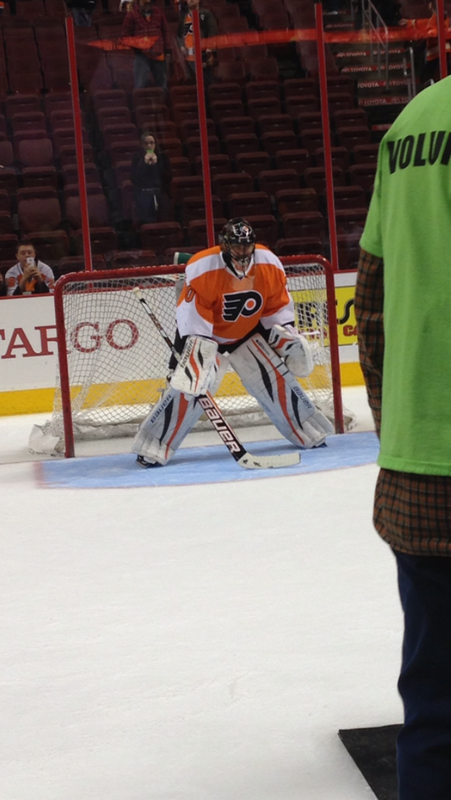 Bryzgalov will now get million dollar checks from the Flyers until 2017. Think that’s bad? How about the $21 million dollar deals Vincent Lecavlier and Mark Streit signed this past offseason. Both players are in their mid-thirties, an age that most players see their stats and production drop off, not improve. Bottom line, Paul Holmgren is SCREWING the Flyers’ organization. His propensity for star players forces the Flyers to commit large chunks of their money to big name players who don’t necessarily win games. Goaltending issues STILL exist in Philadelphia after the Ilya Bryzgalov nightmare, a move that Holmgren himself dubbed “a huge mistake”. Now the good ship Flyer doesn’t have an experienced skipper to lead the way. New Flyers coach Craig Berube has been a head coach in the AHL, but has never led an NHL team before. Bottom line, things in Philadelphia are sort of messy. As a dedicated fan, I am extremely saddened to see Peter Laviolette leave Philadelphia. He brought intensity and energy to a team that led Philadelphia fans on a wild ride in 2010. Now, the Flyers are a team in shambles with a very unsure future. Flyers owner Ed Snider needs to take responsibility and cut the cord between the Flyers and Paul Holmgren. The Philadelphia Flyers have announced today they will exercise their second compliance buyout on goaltender Ilya Bryzgalov. Flyers general manager Paul Holmgren released a statement Tuesday to the media to announce the move. “This was a very difficult business decision to make for us and we want to thank Ilya for his time here and wish him all the best moving forward,“ Holmgren said. Bryzgalov was the main piece of a major roster overhaul for the Flyers in 2011. Holmgren traded away captain Mike Richards and leading scorer Jeff Carter to clear cap space for Bryzgalov, who signed a nine-year, $51 million contract with the Flyers. Holmgren believed Bryzgalov was the superstar goalie the Flyers long needed to finally win the Stanley Cup. Bryzgalov showed some glimpses of greatness, but was far too inconsistent, especially in the 2012 Stanley Cup Playoffs. In two years, Bryzgalov saved 90.5% of shots and allowed 2.61 goals per game. In 11 games in the 2012 playoffs, Bryzgalov was 5-6 with a 3.46 goals allowed average. The move clears up valuable salary cap space for the Flyers, who will save $5.67 million in 2013-14. The Flyers will pay Bryzgalov $1.6 million over the next 14 years to buyout his contract. That leaves the Flyers with Steve Mason as the starting goalie. Mason, 25, impressed in his 7 games this year with the Flyers, saving 94% of shots with a 1.90 GAA. The Flyers are looking for a backup for Mason as well, and with more cap space, look for a move to be made soon. On the ice and in the sport of hockey, nothing is as crucial as the save. But for Comcast-Spectacor Charities, it’s the save off the ice that counts. Every year in late-February or early March, the Flyers Wives, a division of Comcast-Spectacor Charities, host The Flyers Wives Carnival, a fund-raiser event aimed toward the Flyers, their fans, and the community. The 36th Annual Flyers Wives Carnival was held Sunday March 3rd from 1:30-6:00 p.m, where a sea of orange, not only from fans, but players—past and present– adorned the Wells Fargo Center. For some first-timers, like J.R. Carden of Philadelphia, the rookie experience was a bit much to take in all at once. “I literally just walked into the door, and I’m overwhelmed. It’s like a big family almost; no pushing, no shoving, just easy, nice fans everywhere. It’s pretty comfortable. My daughter is off and about, and I’m trying to figure out what to do for the day,” said Carden. For Carden and others, plenty of options existed, all for a good cause. Current Flyers—names like Wayne Simmonds, Brayden Schenn, Luke Schenn, Scott Hartnell, and Zac Rinaldo were signing autographs and taking pictures while up on the Mezzanine Level of the Wells Fargo was the “Alumni Alley,” where past players like Brian Propp, Jim Dowd, Ray Allison and Bob Kelly were mingling with fans. Featuring its inception in 1977, the Flyers Wives Carnival grew following the death of former Flyers defenseman Barry Ashbee after a battle with leukemia. “It’s amazing how much it’s [The Carnival] grown. My first one was back in the ’80s, and [now in] 2013, it’s amazing how the charity keeps on growing and evolving and more and more people keep coming out. This definitely has to be one of the better run charities,” said former Flyer Ray Allison, who played with the club in the mid-1980s. Comcast-Spectacor offers support to over 60 charities in the Philadelphia region. Located on the 11th Street Atrium inside the Wells Fargo Center was Briere’s Bunch, forward Danny Briere’s charity., which is affiliated with Camp Good Days and Special Times, Inc.
“Camp Good Days and Special Times helps children with cancer in both New York state and Pennsylvania providing camping programs at our recreational facility in Keuka Lake in New York. Today, we’re selling “Briere’s Bunch t-shirts as well as hats complete with Danny Briere’s autograph,” explained Lisa Donato, Regional Director of Camp Good Days and Special Times Inc.
For Mike from Hatfield, who has been attending the carnival for the last “seven or eight years,” the event itself doesn’t get any better. “This is pure enjoyment in general,” he explained, while brandishing several autographed memorabilia, waiting for goalie Ilya Bryzgalov to come out and sign. “I’m a little upset that they had to change the Yoda on Bryz’s mask from orange to green, but I understand.” Bryzgalov had his goalie mask changed heavily to a Star Wars-themed one two weeks ago, to the delight of many Star Wars—and Flyers—fans. “I absolutely plan on coming back again next year,” offered Mike. However, fans aren’t the only ones who find themselves coming back year after year. For Jakki Clarke, the daughter of Flyers legend Bobby Clarke, the carnival has been a staple in her life. “I’ve been coming here since the beginning . It’s so much fun, and we’ve got the best fans of any city in the World,” said Clarke. For a fee, fans were able to take shots on goaltenders Brian Boucher and Ilya Bryzgalov in the same net that goalies mind throughout the season. Where center ice would normally be was replaced by a “mystery bag” hand-out, where for $25, fans could receive a draw-string bag and it’s contents could contain an iPod speaker, an autographed puck by various current players or even a Flyers legend. Fans of all ages were involved in Mario Kart with players like Luke Schenn, or NHL ’13 with Captain of the Flyers, Claude Giroux. Hockey die-hards could also take pictures with the Conn Smythe, Vezina and Hart Memorial Trophies, respectively. Returning to Philadelphia last week via trade, forward Simon Gagne proved to be a popular choice among everyone involved at the event, including Krystina Whetstien, who brought her newborn to the Carnival. 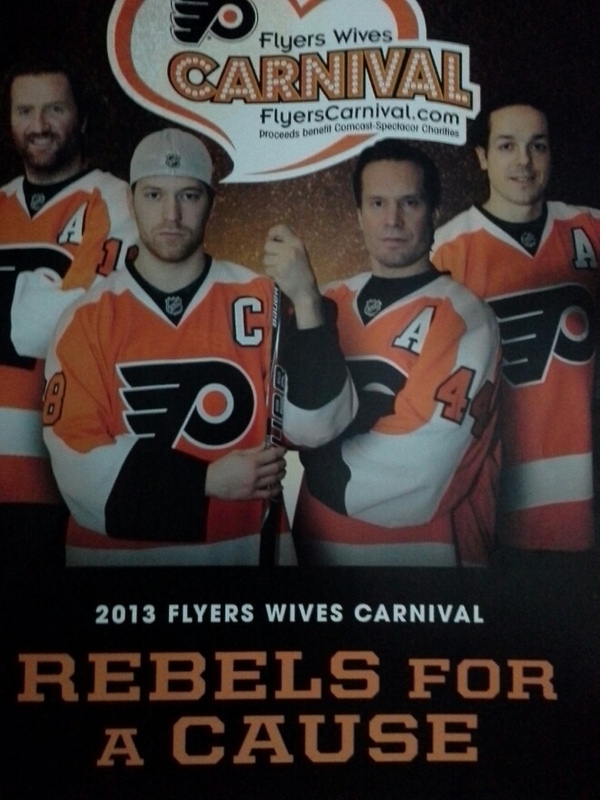 For many teams, the success of a charity event like the Flyers Wives Carnival is attempted, yet never duplicated. “This has been terrific. The entire league comes here to look at what the Flyers do, much more than just the NHL. Every sport virtually, Major League Baseball, [The National] Football [League], they’ve all sent representatives to see how the Flyers did it, how they integrate with the community. All the charities that have benefited get bigger and bigger. Now the great thing is that you actually see fans from back in the ’80s now with their kids coming to this. The Flyers have had this “family” built in earlier than most,” said Al Morganti, game analyst for CSN Philadelphia and WIP personality. “Hell, the Will-Call folk are like family,” suggested Carden. It was apparent a sense of community was present throughout the day, whether it be winning one of ten dog tags with a Flyers player on it, or waiting in line for a Danny Briere autograph/photograph combo. A family event for all ages, the success of the Flyers Wives Carnival throughout the years will bring fans back for decades to come. To read more about Camp Good Days, visit their website at www.campgooddays.org and to see a complete list of charities Comcast-Spectacor services, visit http://www.comcastspectacorcharities.org. 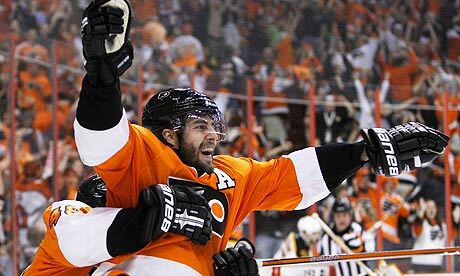 In 664 games with the Flyers, LW Simon Gagne had 259 goals and 265 assists in ten seasons. The Philadelphia Flyers already brought back two former players this season, and today they added a third former star. The Flyers traded a conditional fourth round draft pick to the Los Angeles Kings to acquire LW Simon Gagne. Gagne was drafted 22nd overall in the 1998 NHL Entry Draft by the Flyers, and played 10 seasons in Philadelphia from 1999-2000 to 2009-2010. He was traded to Tampa Bay in 2010 for Matt Walker and a draft pick, then signed a two year contract with the Los Angeles Kings in 2011, winning his first Stanley Cup this past season. Gagne, goalie Brian Boucher, and winger Mike Knuble all rejoined the Flyers this season. Gagne was a fan favorite in Philadelphia, known for his speed and offensive abilities. He scored 20 goals in his rookie season, and scored 30 or more goals four times in Philadelphia, including a 47-goal season in 2005-06. He is perhaps better known for his clutch scoring in the Stanley Cup Playoffs. In 2004, Gagne netted an overtime winner against the Tampa Bay Lightning in Game 6 of the Eastern Conference Finals to keep the Flyers alive. More recently, Gagne scored the overtime winner in Game 4 of the Eastern Conference Semifinals in 2010 against the Boston Bruins. And the left winger forever surmounted his legacy in Philadelphia by scoring the deciding goal in Game 7 of that same series, capping an incredible comeback from three games down. Gagne is a bit older and more susceptible to injury than he was during his prime years with the Flyers. He suffered a concussion that ended his season in 2008 after just 25 games, and another in December 2011. Gagne was out until the Stanley Cup Finals, where he played four games but did not score a point. In 11 games with Los Angeles this season, Gagne has no goals and five assists. Gagne returns to a team decimated by injuries and inconsistency this season. The Flyers have recently surged into the top ten in goals scored, but also lost center Matt Read for six weeks with a rib injury. Gagne will fill a hole for the Flyers and provide much needed veteran leadership. Joining farmiliar names like Danny Briere, Claude Giroux, and Mike Knuble in the lineup, Gagne could help the struggling Flyers get back on track. Gagne is in the second year of his contract, earning $3.5 million this season. He will become an unrestricted free agent at the end of the season.